ISOCEM S/L is a foaming agent for next-generation cellular concrete. Its natural surfactants, mixed with plant-based raw materials, make it very powerful and effective. Although it is a foaming agent for cellular concrete, it can also be used as an air-entraining additive for cement mixes containing lightweight aggregates such as polystyrene or vermiculite. 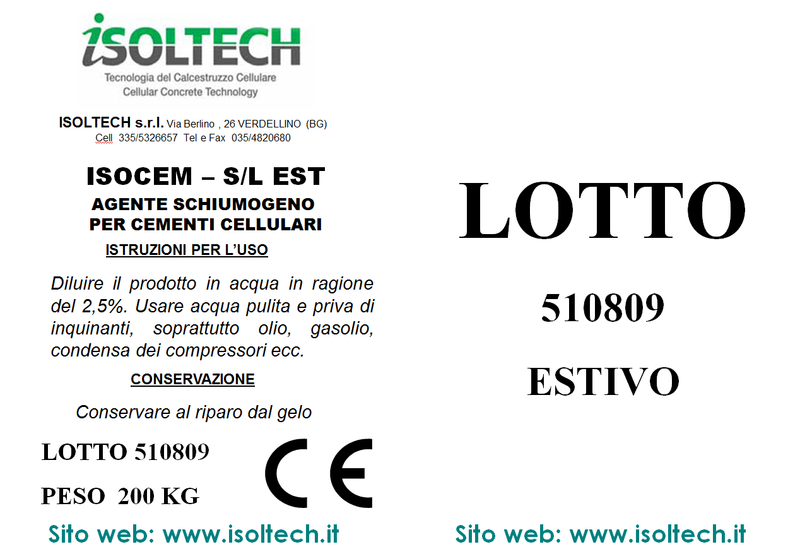 Isocem S/L is a foaming agent for cellular concrete developed by Isoltech. The foaming agent for the production of Isocem S/L cellular concrete is used in percentages equal to 2.5/3% and is suitable for applications such as screeds, sloping roofs and terraces, roadbeds and fillings. The physical properties of the cellular concrete obtained from the use of the specific foaming agent Isocem S/L are, however, influenced by the foam/cement ratio, which influences the densities obtained and with it the final properties of thermal insulation and acoustic insulation.